Gmail has become an integral part of our daily life, and we would like to have atleast a backup of memorable or important emails. 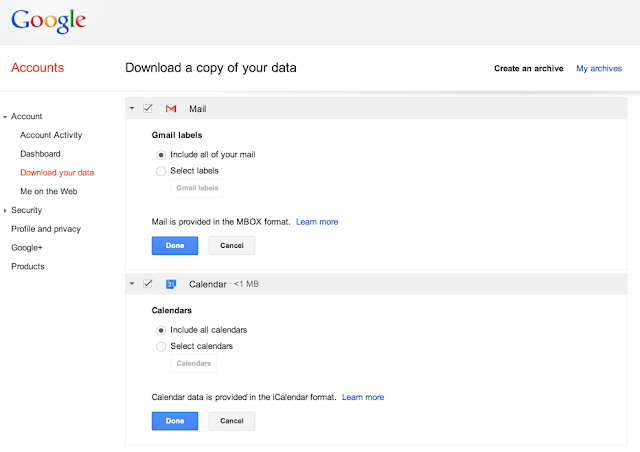 Now you can, Google have just updated Gmail with the ability to download, the mail as well as Google Calendar data. You also have the option of downloading from a particular label (category) as well. Not only that but you can also download one big archive file, consisting of Gmail, Calendar, Drive, Youtbe and Google+ data. Currently you can only download calendar data, but Google has promised that the complete service will be available by next month.